Review of Aecht Schlenkerla Rauchbier Urbock | Beer Apprentice - Craft Beer News, Reviews, Interviews and Info. For today’s craft beer review I’m going to be trying the Aecht Schlenkerla Rauchbier Urbock produced by Brauerie Heller-Trum/Schlenkerla located in Bamber, Germany.I’ve tried both the Marzen and the Weizen from Schlenkerla and really enjoyed them, so I’m betting this brew falls along the same lines as those two. Here’s the description from the website, schlenkerla.de, concerning the Urbock. A Smokebock for the strongbeer-season (October through December). Matured for months in ancient rock-cellars underneath Bamberg and tapped freshly from the oakwood cask. Well, it’s a little past December, but no matter… I’m gonna drink it anyway. This brew comes in a 16.9 oz. bottle and it has an ABV of 6.5%. It poured a deep brown to ox blood color with some ruby highlights at the bottom and around the edges of the glass. It also appeared quite clear for the most part. The collar was khaki in color and of good size. It was smooth and creamy with some small, tightly compacted bubbles. The retention time was above average and the lacing was adequate as well. The nose was very similar to the other Schlenkerla brews that I’ve tried. It smelled of smoked country ham and bacon grease with hints of peat and earthiness. Some very pleasing “woody” aromas conjured up familiarities of a summer campfire. Very well balanced and delightful. The taste was more of the same. Big and smokey with a nearly identical profile to the aroma. Salty country ham and sugar cured bacon. Roasty malt and grain. Very earthy and woody. It, literally, tasted like liquid smoke. The overall flavor wasn’t that complicated to tell the truth, however the uniqueness and differential aspect just begs for appreciation. The mouthfeel was medium to medium/full bodied. Smooth, dry, chewy and somewhat filling. The carbonation was good and it left an agreeable amount of flavor behind on the palate after each sip. 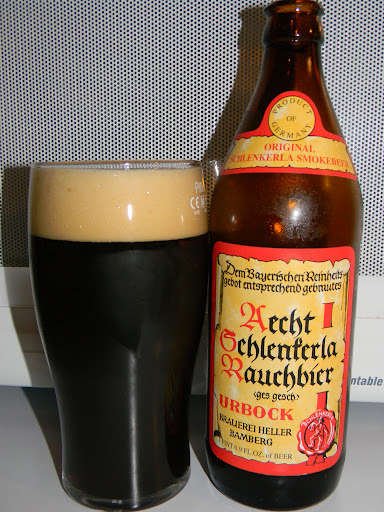 As with all of the Schlenkerla products that I’ve tried, the Urbock is very distinctive and very good. Although, it doesn’t lend itself to a high drinkability rating. One or two would be all that I could handle during one setting for the simple fact that I think the “smokiness” could become a tad overbearing after a while. It’s still rather tasty though and would be worth a try for those looking to experiment with something a wee bit different and out of the ordinary from the traditional styles that we see everyday. Of all the “smoked” beers out there, these guys know how to do it best. Thanks for reading and commenting guys. Be sure to look me up on Twitter (@BeerApprentice) and Google+ (Beer Apprentice) if you would like.